Ironman Fire n Ice Aventador! Further to revealing Captain America Gallardo edition of the breathtaking Lamborghini Aventador, German Graffiti artist Rene Turrek finally unveiled his ground breaking "Ironman Fire n Ice Aventador". The epically expensive paint job costs approximately 35,000 Euros. Before you start wondering why (Well, if you do), you should probably know that this custom made paint job changes its color according to different temperatures. 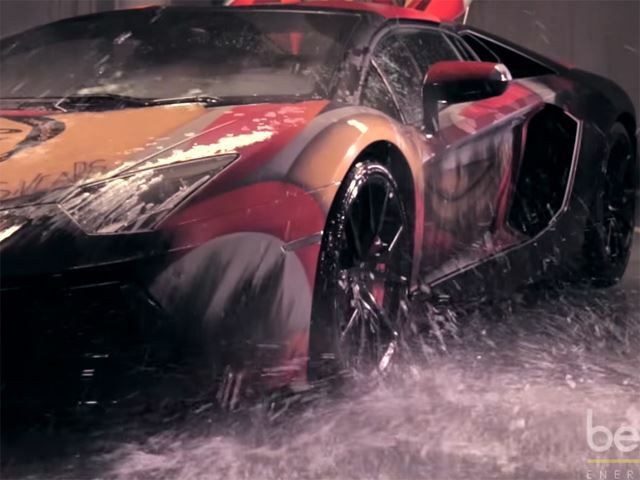 In cold weather, water or ice, the Aventador features a matte black finish; whereas, in the sun or in warm water, the Ironman graffiti will show! We don't know about you, but this is definitely an ultimate unbeatable super car!